Style, comfort and serenity in an Andalucian mountain village. Rated 9.4 of 10 in 53 reviews. 7 rooms. 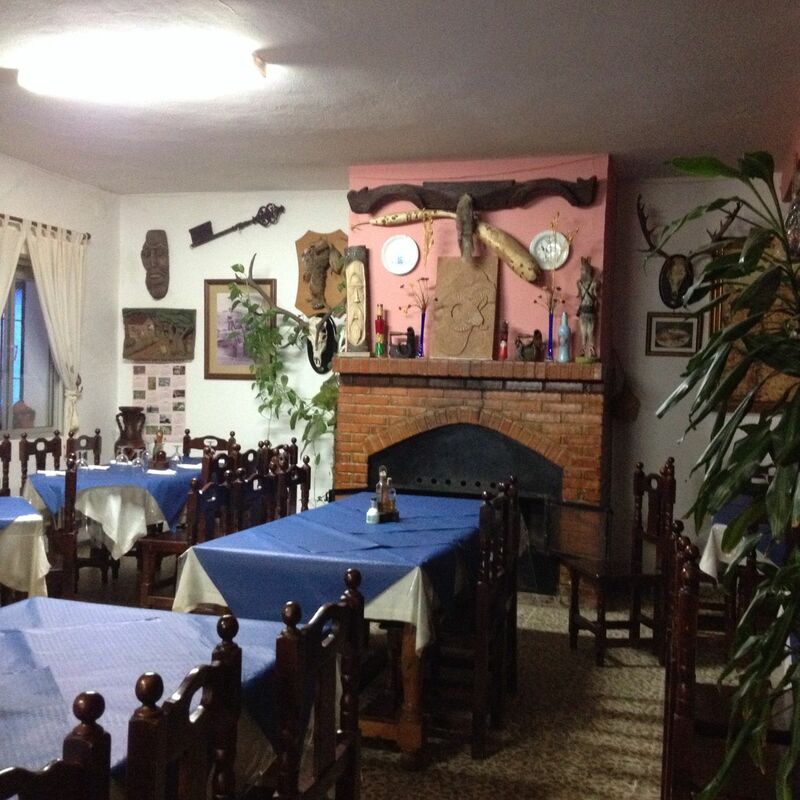 If you’re looking for a relaxed and friendly small hotel in Andalucia, super comfortable and super serene, then Los Castaños is the place for you. 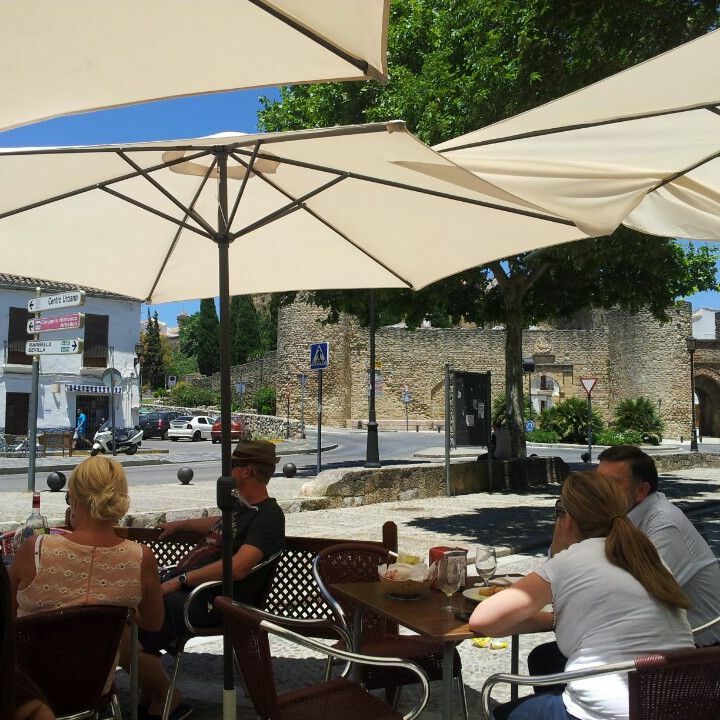 Perfectly located for visiting Ronda and other historic Andalucian cities, this is the ideal place to relax and chill out, with fabulous walking, soaring eagles and a small pueblo blanco to explore. Somewhere to take a deep breath of pure mountain air and completely relax. 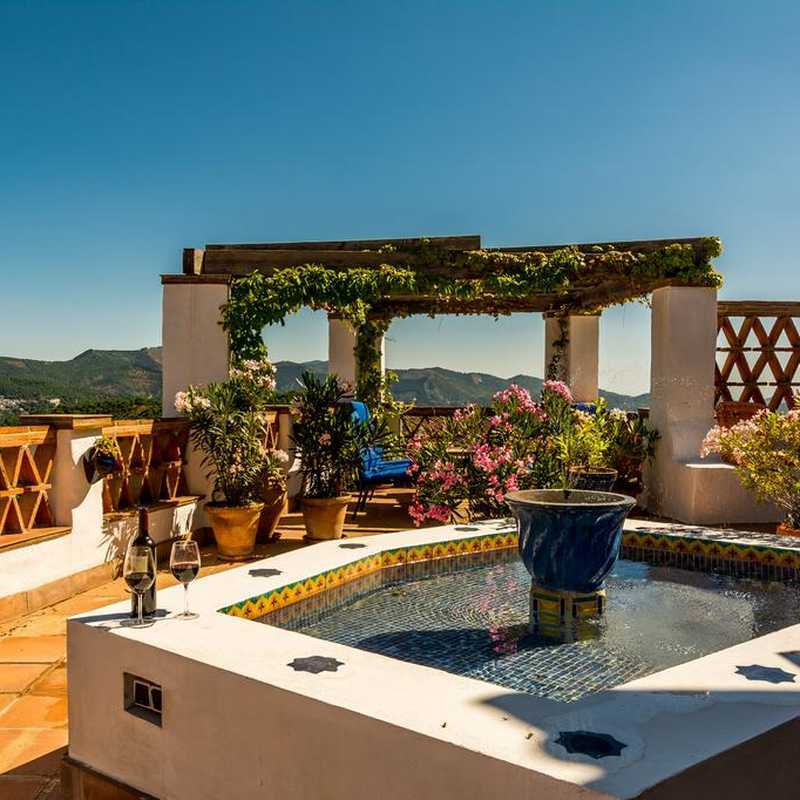 Our small country hotel is in quiet Cartajima, a relaxed Andalucian mountain village in the Alto Genal valley which is part of the Serrania de Ronda and just 17 km from bustling historic Ronda. The village is a little lost in time, very traditional and surrounded by stunning mountainscapes. Quite a contrast! While you enjoy luxury and comfort inside, traditional old Spain, The Real Spain, awaits you outside. Our six ensuite rooms are super comfortable, well-thought out and with touches of luxury. We may be off the beaten path but don’t think there is nothing to do. There’s plenty! If you are into walking, this is a paradise. Hike through stunning landscapes or scale Los Riscos for amazing views of Africa. We are conveniently located for Sevilla, Cordoba, Granada, Cadiz, and Jerez – the romantic cities of Andalucia. 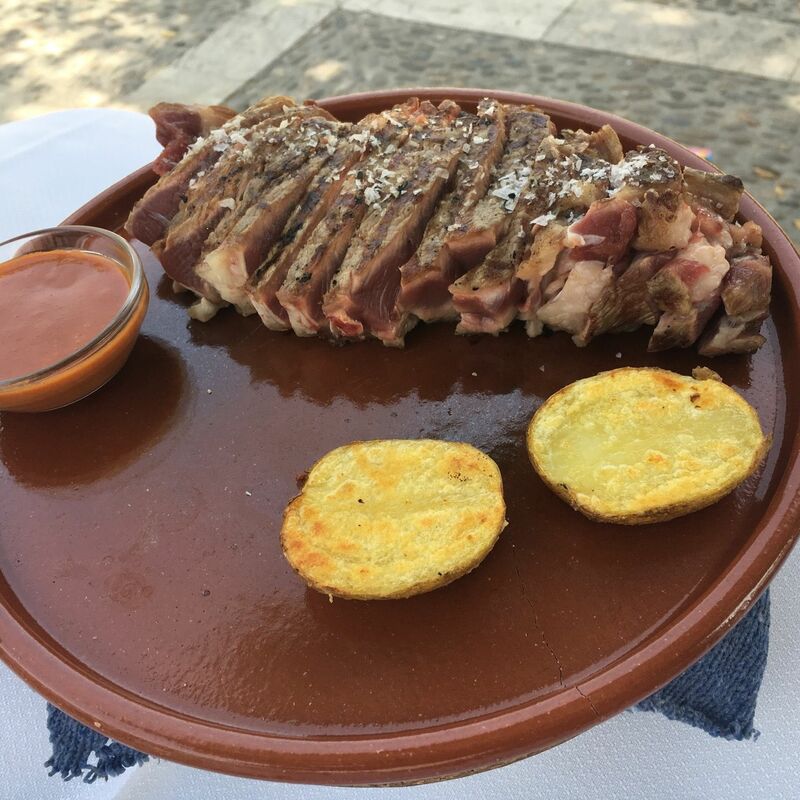 Los Castaños has been praised for the personal attention of the owners, Di and John, for their detail oriented approach to hosting, for the wonderful food prepared lovingly by Di and the tasty local Ronda wines served up John. He makes a pretty special Gin and Tonic as well! Your every comfort has been considered from superb beds and linen, to the ecological olive oil bathroom products which are provided. The village of Cartajima is a special treat as it is picturesque but natural. It is what it is, a traditional Andalucian mountain village where the villagers are still interested, even slightly wary, of foreignors be they from the United States or Madrid. The proximity to Ronda makes Los Castaños the perfect place to stay while visiting this very interesting but extremely busy tourist centre. You can return home after a day´s sightseeing to the total peace of the hotel, dine with other like-minded travellers, pick up a book, play a game, listen to music. 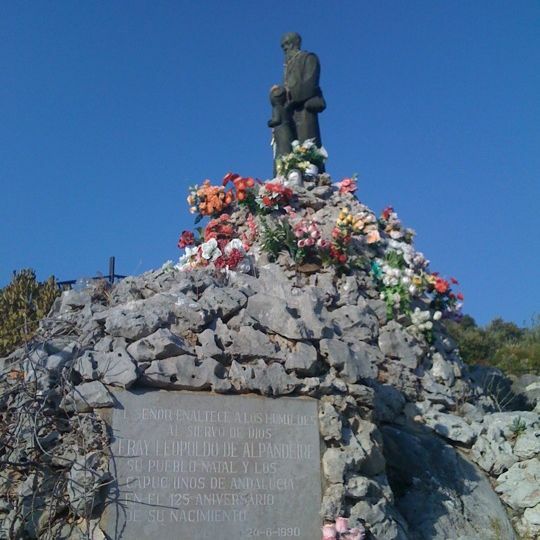 Los Castaños is the centre of a marvellous hiking area. Cartajima is one of seven villages in the valley all of which are connected by country roads and trails. One seldom encounters another person except perhaps a local farmer on his way to tend his crops. The walks are medium in difficulty and involve descent and ascent of up to 600 metres. We can provide details notes, walking poles, and a rescue service should you decide to give up at any point. Our guests, who come mostly from the professional and medical worlds, are lovers of the natural world, interested in the fascinating history of Spain in general and Andalucia in particular. They come mostly from the English speaking countries, USA, Canada, Australia and UK, but increasingly also from northern Europe - Holland, Germany and Scandinavia. They are friendly and sociable and interested in sharing experiences with other guests. 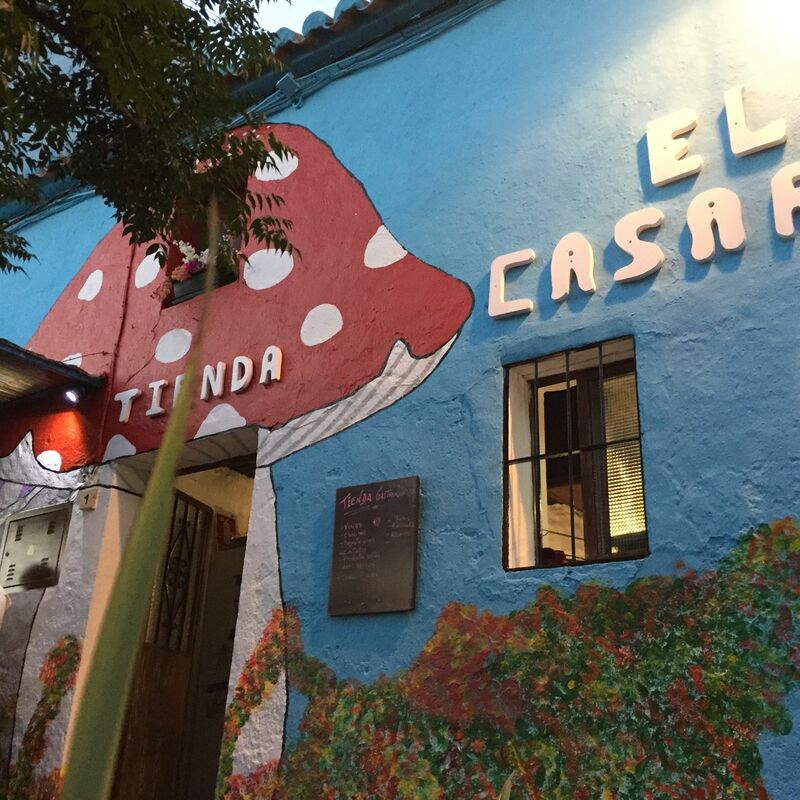 This bar opened in 2017 to the delight of the Cartajimeños. 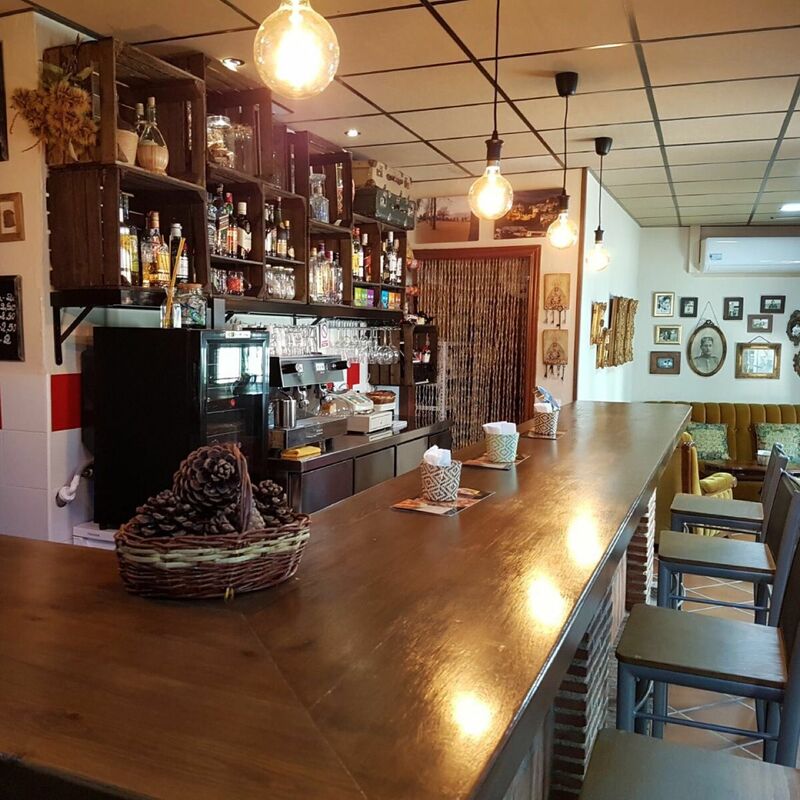 It´s a rather sophisticated place by local standards and a really pleasant bar to spend a few hours, chatting to Maribel and Antonio, and sampling their quite interesting tapas. 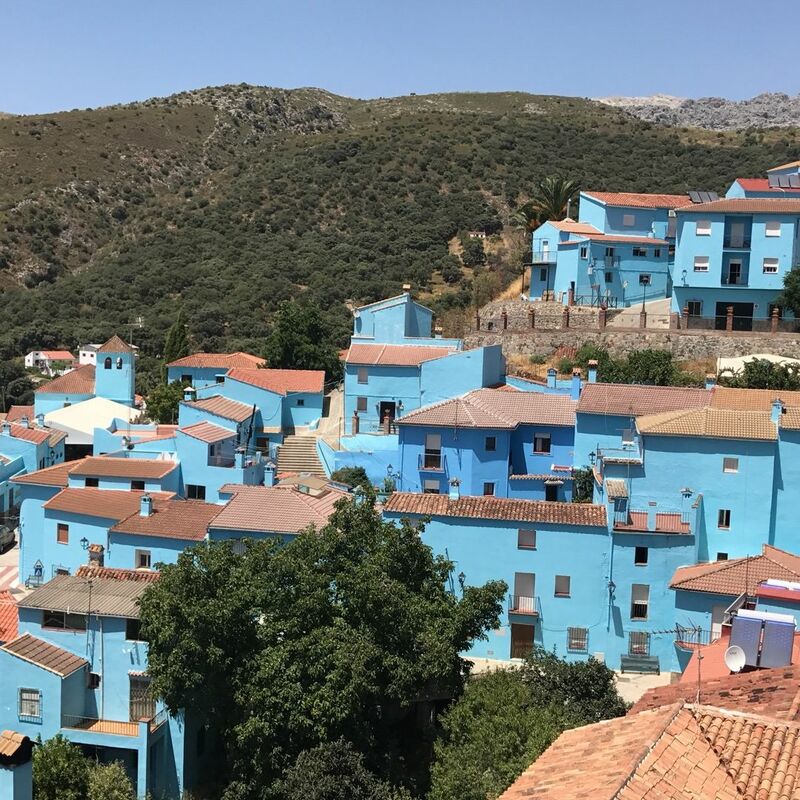 This little white village was painted blue by Sony Pictures some five years ago and declared the only Smurf town in the world!! Since they it has been stripped of its Smurf identity but remains painted blue which makes it the only white village that is blue! It´s fun to visit and it has a couple of decent bars where you can eat and hang out observing the local scene. Very good café con leche just 1€. Nice terrace for a coffeebreak in Smurfstown. Lovely breakfast pitstop with the bikers...very friendly service..
Great home made food! No menu, just fresh ingredients! Ask for the price first! Really good food! I will miss this place. The best of Ronda! Drink Azpilicueta Rioja if you are looking for a local red wine. 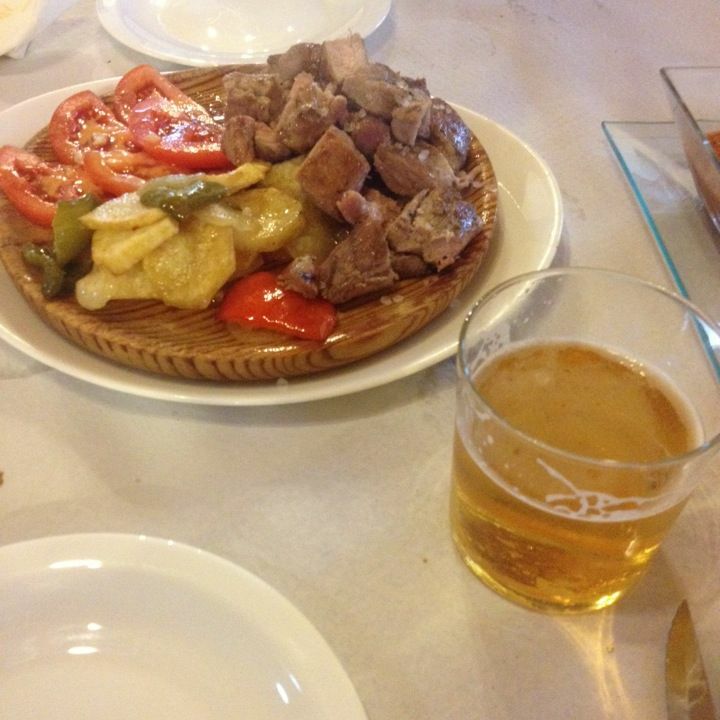 You can eat fried anchoives, grilled kingklip, pincho de gambas and pavias de gambas as raciones and tapas. Best tapas in Ronda ! Make sure to reserve a table. 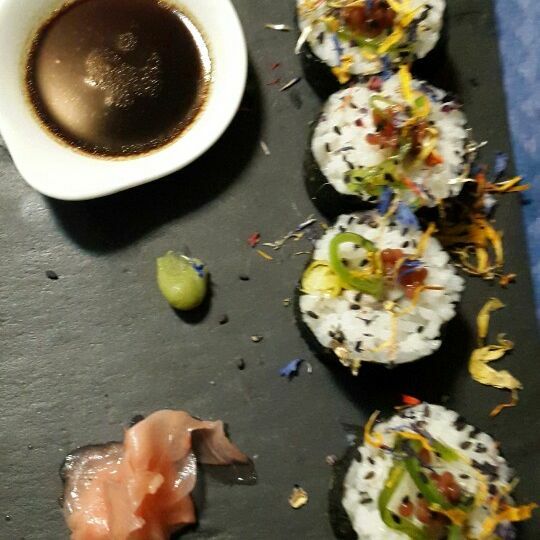 Let the chef decide for you and you won't regret it ! Most amazing experience. 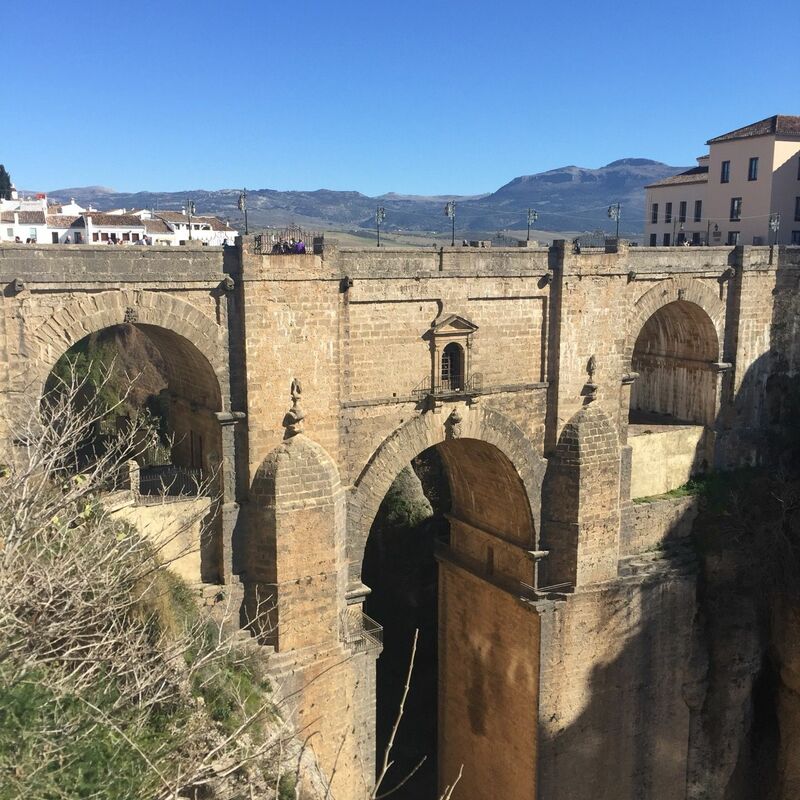 The busy town of Ronda has ancient roots making it a fascinating place to explore. The old town has palaces and fine mansions that one can visit, museums, ancient churches, and art musems. Also known for its shops, one can find ceramics, leather goods, and particularly shoes. Ronda has a wealth of restaurants and bars to explore and a growing reputation for fine gastrotapas. There are several places that offer classical Spanish guitar concerts and a recent addition to the visitor´s menu is a hammam, right next to the Arab Baths - both of these sites are well worth the experience.